The Valley floor has enough snow to hamper our trips around town, to shovel out our driveways or to clear off the back deck. Get off the beaten track however and you or your dog can sink up to your knees. 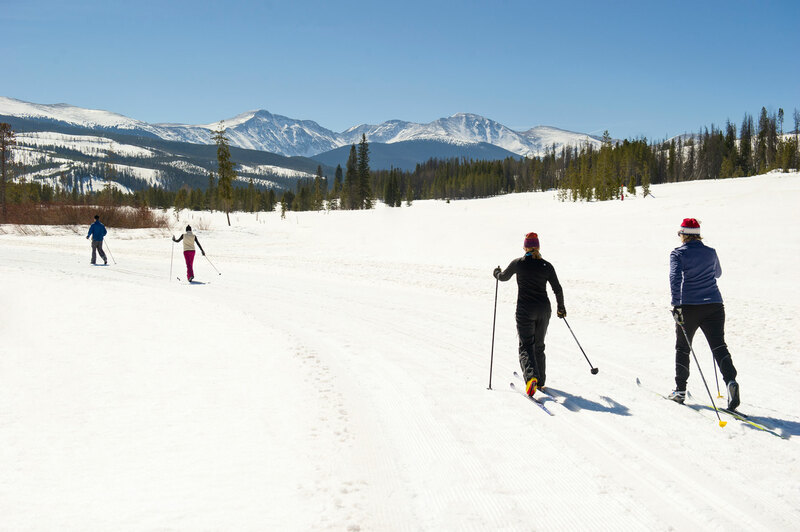 The mountain snows are deep and all around the towns of Winter Park, Fraser and Tabernash are miles of old logging or waterboard roads and trails that climb up through the surrounding mountains and make excellent backcountry touring trails. The Experimental Forest trails with Deadhorse Loop and St Louis Creek, Big and Little Vasquez, and Idlewild depart close to Winter Park, and roads like Corona Road on the East side and Elk Creek on the West eventually lead to the Waterboard roads on each side of the Fraser Valley that are packed by snowmobiles and other cross country skiers. You can ski from the Winter Park Resort to the Experimental Forest on these Waterboard roads. These higher areas have received even more snow and early season conditions have been fabulous. What a difference a few inches of white stuff makes in our mental attitude and our economy! As we get more snow, the best of these trails in and around towns in my opinion is the Fraser River Trail starting at the Winter Park Resort down to Grand Adventures and Rendezvous east of the town of Winter Park. You can keep going behind Safeway and on to County Road 8. Then cross Hwy 40 to the Fraser Ballfields and take the Fraser-to-Granby trail to Tabernash, the YMCA, on through Tim’s Tunnel to Fisher Creek and connect into the Granby Ranch Nordic Trails. Much of this is groomed wide enough to skate, conditions allowing, because it is a corridor trail but remember snowshoers and walkers with their dogs are also allowed so be courteous. When possible, a track is even laid and we ask others to stay off and leave the track for the skiers! There are plenty of spots to hop on or off the trail with free parking (Safeway parking lot, Grand Adventures parking lot, Fraser Ballfields parking lot, Tabernash, YMCA front lot, etc.) and even transportation along the way. Recognizing the value of grooming these areas, HTA coordinates the towns contracting with Mountain States Snowcats to groom within the town boundaries and John Brammer and Mike Mason grooming beyond to Snow Mountain Ranch and Granby Ranch. With the recent winds, watch out for downed trees and windblown spots. Please report obstructions to the local Headwaters Trails Alliance (HTA) office 970-726-1023. 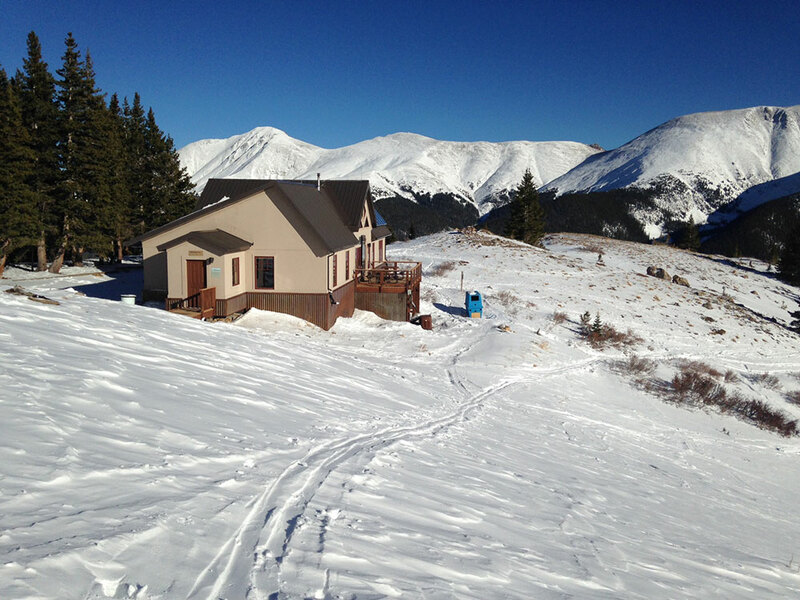 Higher up Berthoud Pass, First Creek and Second Creek have well used trails (if the wind has been kind) and you can find the Broome Hut (booked through 10th Mountain Huts) a mere mile off Hwy 40. It’s a tough ski or try snowshoes for an easier go. Above the hut you can access great terrain above treeline. Another popular hut is the High Lonesome Hut across and down the valley near Meadow Creek Reservoir. Another hut is in the works – look for more information from Grand Huts in the summer of 2019. Toward Grand Lake, the Doe Creek loops are off Arapahoe Bay Road. Or once in the National Forest, turn off Hwy 34 at Greenridge to go to Ranger Meadows from Shadow Mtn Dam. For a dog friendly area, try Pine Beach just up the road. Rocky Mountain National Park offers the popular Adams Falls, North Inlet or East Shore Trail but dogs are not allowed. These areas are not patrolled, not maintained and winter conditions come and go, sometimes with blowing snow and double digit below at night. With the temperature fluctuations and blowing snow this month, avalanche danger will be present with early season accumulation. Be courteous to each other but GET OUT THERE. Go prepared with heavier duty equipment and a pack with extra clothing, food and water. Many of these areas are great for your dog but be careful of animals that your dog might chase or might chase you! Some dogs need extra food, water and warmth layers the same as you and they love to carry their own pack available at Icebox in Fraser and several of the Nordic Areas. Booties or Mushers Secret salve for their feet keeps them playful and moving easily thru the snow. Above all, remember to tell someone where you are going. Free recreational skiing more central in the Fraser Valley is available at Pole Creek Golf Course – another great amenity from your Fraser Valley Metro Recreation District. As the snow gets deeper, please stay on the packed cart paths away from the greens, tees and water hazards. The greens are roped off – trekking over the greens will kill the special grass and give reason to revoke the privilege of skiing there. The rolling terrain is delightful for both you and your dog but skiing is at your own risk. The first full moon ski is Saturday Dec 22 430p-830p -enjoy the bonfire and hot chocolate then have dinner afterwards at Bistro 28 in the Clubhouse. Dinner is available Thurs-Sun and the public is welcome. For more information call 970-887-9797 or 970-887-9195. Wherever you go, be safe. Tell someone where you are going and always carry the 10 essentials. See you on the trails! Happy Holidays, be courteous and ski safe!